I don’t know about you guys.. but Michael Myers- is SO OVERPOWERED. When he activates his Evil Within power, he gains an extreme amount of speed. I understand that that’s his ability but I think the speed he gains is a bit much :/ he can already down you instantly with one hit, is the crazy speed increase really necessary? (I don’t have him as a killer but I often go against him and it’s reallyyyyyy overwhelming. Anybody else agree? He doesn't get any speed in tier 3 are u styoopid? michael myers in tier one is extremely slow. i dont have the exact number, but id say he is around 108% movement speed, which is basically nothing. he also has a decreased lunge attack. once he tiers up into tier two though, he will be set into the normal 115% movement speed and given back the normal M1 attack. he also benefits from a smaller terror radius in that state. when he pops tier 3 though, his movement speed does not change. however, his attacks deal more damage and his lunge attack is increased, together with his vaulting speed. he has the normal 32m terror radius during evil within 3. TL;DR his movement speed between evil within tier 2 and tier 3 does not change. I think he's fine and can be a lot of fun to face. He moves extremly slow in Tier 1 and in Tier 2 and 3 he moves at the same speed as Trapper or any basic Killer does. He just vaults faster and has further lunge in Tier 3. But that's not the Killers fault if you don't know how to counter it. When I get asked who is the most frightening and lethal Killer, I always say Myers. He's dangerous, but he's not OP, it all depends on who's playing him. What bugs me about The Shape is one thing: Why does he groan when he gets hit? Never once in the entire Halloween series has Michael Myers ever groaned in pain. He always took the hits like a champ. Gunshots, stabs, getting run over, falling off balconies. Anything you threw at him he tanked like a beast. But somehow in this game when a pallet falls on him or a survivor escapes his grip he screams. This definitely needs to get patched in the new update. They should make him not scream when he gets hit. He is not screaming , he does moan ...like Ohh when he was stabbed by Laurie in the Original Halloween movie . it just sounds like when playing Killer because you are the killer just like how IRL you talk , you sound loud , but , your soft to others. We've got shirtless David. 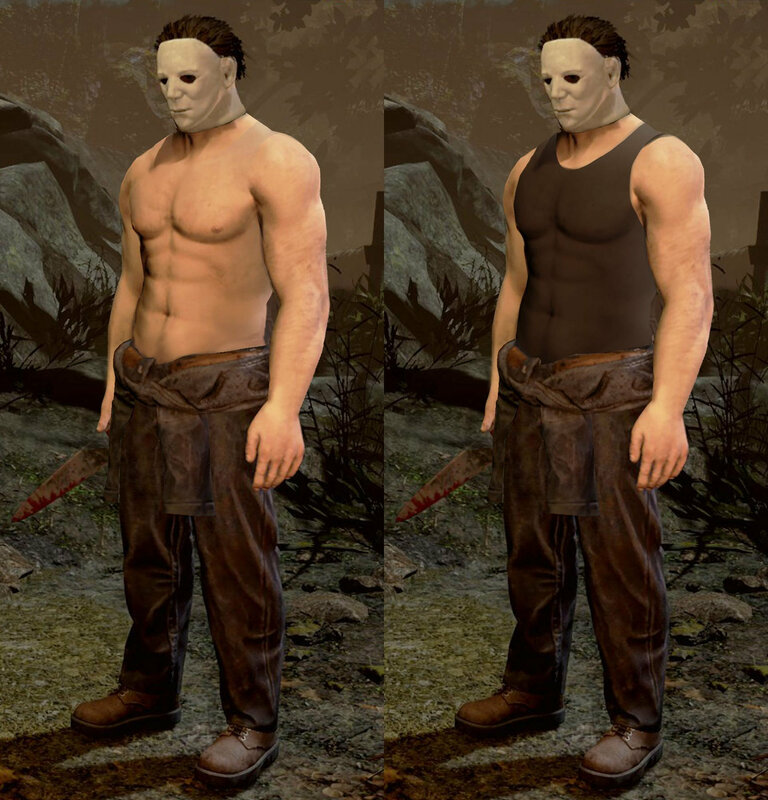 It's time for shirtless Myers. His speed does NOT increase when he enters Evil Within III. Whoever did that Myers groan in the game deserves a promotion. I swear, best thing about the game for me. He didn't moan when she stabbed his eye, he was making those weird moaning sounds before she even stabbed him. It was sort of like he was frustrated he couldn't reach her or something. If you watch the scene it shows he didn't moan to her stabbing his eye or his chest with that knife. Hell even when the doctor shows up and shoots him multiple times he was still silent. I main Myers and I do think he is a very strong killer BUT it is all based on add ins and how well you can mind game. If you have a group of good survivors they can counter him with some half decent coordination. I get a 3k or 4k game everytime I use him but playing against him as survivor I know his tactics and how to avoid him. I highly suggest, to all survivors having issues playing against certain killers, playing those killers for a bit to understand their strengths and weaknesses. Know your enemy and how to counter them.